The Task List is a dropdown menu that appears on a user's Party page. It includes many objectives in an achievement-like manner that can be completed for various amounts of Credits. How the Task List appears on the 'Party' page. Tasks show the user different aspects of the site, while rewarding them with Credits. There are different categories of tasks that can be given, ranging from interacting to summoning a Legendary Pokémon. Task details are taken from the Wiki itself, so editing any of the corresponding pages will change the Task's description on-site. Possible formatting is linking, bolding and italicizing the text. Miscellaneous tasks don't have a follow-up task, and instead end at the single completed task. Read Me Read this task ??? 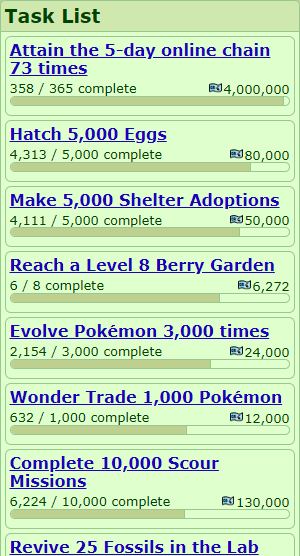 The Tutorial shows the user the most important features of PokéFarm Q and how to access them. Holding an Egg or Feeding a Pokémon a Berry is an Interaction. Interactions help Eggs to hatch and Pokémon to grow. Hatching Eggs is one of the main features of PokéFarm Q, as it allows the user to fill their PokéDex and to unlock new Summon Items. Evolution is a necessary part of filling the PokéDex. Mega Evolution is possible by giving a Mega Stone to a Pokémon and visiting its summary page. Scouring is a way to obtain different Items by sending out Pokémon to certain Areas for an hourly duration. Summon Items can be used to summon Legendary Pokémon after they are unlocked. The Shelter holds all released Pokémon and Eggs. DayCare Eggs that haven't been picked up after a set amount of time are released into the Shelter. It is possible to trade with another user or receive/send a gift in the Trade Centre. Wonder Trading can also be done in the Trade Centre. It is not possible to know who a user trades with during wonder trading. Battling is possible through unlocking the Dojo after hatching 100 Eggs. The Berry Garden allows the user to plant, water, and harvest Berries. The Pokérus doubles the received Interactions and Interaction Points. Users can get it by interacting with the current Pokérus Host. Badges can be constructed in the Wishforge using Gems and Treasure. The Online Chain is how many days a user has been online in a row. It is displayed in a popup when a page is loaded for the first time on a new day. Fishing is done at the Fishing Hut with either the Old Rod or the Good Rod. Four different zones are unlockable depending on how many fish the user has hooked. Fossils are revivable at Professor Holly's Lab. These Pokémon are denoted by a Prehistoric Icon and give a special EXP Boost to members of their evolution line. This page was last modified on 1 April 2019, at 20:35.